Hermosa Beach- fun and laid-back South Bay beachfront town.Host of popular beach volleyball tournaments. Palisades Park- Santa Monica - take a wonderful walk along this cliff-side park that overlooks the Pacific Ocean.Once of the most scenic spots in the Los Angeles area. Santa Monica Pier- world famous attraction with the 1922 Merry-Go-Round (Carousel), Roller Coaster, and many entertainment attractions. LA Photos- great photos of Los Angeles, many with a focus on site-seeing. 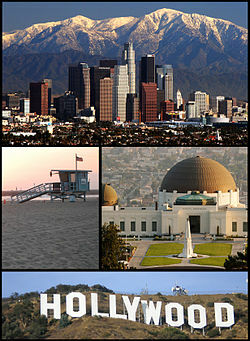 Venice Beach & Boardwalk- Venice - one of the most visited places in Los Angeles! Westwood Village- popular place for watching a movie at a classic old theater.UCLA college town. El Capitan Theatre- Hollywood - opened in 1926, "Hollywood's First Home of Spoken Drama. "Now owned by Disney (extensive restoration completed in 1991), a great place to see a live stage show. Silent Movie Theatre- Hollywood - the only silent cinema in the U.S.